----------"We cannot be so insecure as to avoid clichés at every pass." I do not know if our 'steemed editor is really as vehemently anti-cliché as he recently asserted, but such was not always the case. He gave me this wise advice a dozen years ago when he caught me apologetically referring to a photo in my portfolio as being something of a clichéd subject. I've taken his words seriously since. And, in a nice coincidence with recent discussions, my eye was attracted just last weekend to such subject matter. So, I noodled around with it and produced the following photos. I like them all; a few of them I'm very happy with. I won't tell you which ones; I leave them for you to contemplate sans comment. Imagine my surprise when I looked at your article having shot the following images below a few months back. Cliché is French for "exposure" in the photographic sense. Perhaps the most useful feature on digital cameras is the "delete" button. Pity it can't be operated remotely. 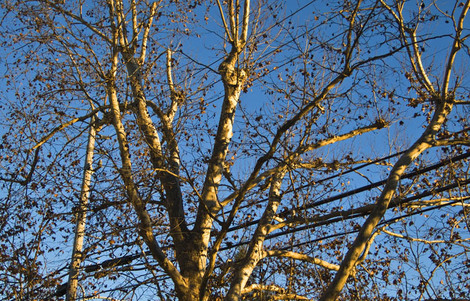 Suggestion-- crop the golden one to a vertical centered (roughly) about the telephone pole. 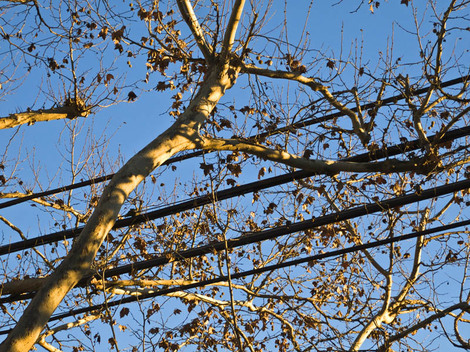 Becomes for me an even more interesting picture, as the eye first registers it as urban/industrial hardware photo and then only secondarily registers that some of the "insulators" and "cable connectors" are actually winged! A bit of a visual double-take. Interestingly, one of my few complaints about this camera's controls is that it's a bit too easy to delete frames one after another. I've killed one or two keepers that way. I think a 'remote' kill button would be way too dangerous in my hands. FWIW, I originally made about 20 exposures. A third got killed in-camera. The ones posted here were culled from the rest. And, as I said, there are only a FEW (note emphasis) of them I especially like. I just ain't telling you which! Oh! - the colour ones are such a nasty shock after the B&W, they're just a visual mess. Numbers 1 & 3 of the B&W appeal to me. Interesting that in this digital age where it is so easy to say "bring out the shadow detail" a silhouette is quite a surprise for the eyes. Keep on enjoying your new toy Ctein, the more you use it the sooner you'll get back to film. First of all one has to differentiate between empty clichés and productive clichés. The former aren't very helpful, they don't tell anything new, they do not further discussions and understanding. In the best of cases they turn into stock images [for the visual arts: literally, in writing metaphorically, or set 'phrases']. Most of the time they just turn into meaningless filler. Often enough we use clichés - just like individual words - as shorthand to make talking about a subject easier, or for quick recognition. They become helpful and productive. In the case of symbols cliché is vital since people have to understand the symbol without having it explained to them*. In photography clichés are bread and butter almost regardless of the branch covered - bride, groom and their relatives expect certain pictures, newspapers and magazines expect a certain kind of picture, advertising cries for clichés etc. Even if one does Art clichés are hard to forego, especially if you are successful and have a following of critics and a set audience. How often does one read bad reviews when an artist tries out something new [this week's Nip/Tuck episode is a good example]. And then ther's the trouble with differing viewpoints and backgrounds ... what for one man is a new look at an old topic, the other has seen much too often. This is especially true of photography when it stays firmly footed in the realm of realism and authenticity. *Nope, that does not mean that every symbol all of the time has to be immediately understood by anybody. I like the Shivanand #1 as is (even though the composition is quite straight forward) because the light has various implications. B&W #1 is two cliches which work for me because the combination is unusual. We all have some version of #3 which I hope doesn't make anyone's favorites list. I've always thought that the most profound observation on photography was made by W. Eugene Smith when he said, "The most important photo accessory is the trash can." Anyhow, when I referred to a remote delete button, I was thinking of it being in MY hands, not the photographer's. i never heard of anyone lending their obviously well-endowed noodle to the task of shooting a cliche and posting 8 clearly defined examples of same on a serious photography website before. Is this a joke that i just don't get? And the part about switching between color and b&w modes on a digi-cam. Is this part of the punch line? Man, i must be blond or something because i have to say, i just don't get it. Sorry. And oh yes, a very Happy Holidays, Ctein. The import of that column was that I am, through some ill-understood psychological mechanism, "hardware driven." I make the kind of photographs suitable to the equipment I have in hand. And, with film cameras, so long as I had one body loaded with each I never had any trouble switching from color to B&W film on the fly (which is far from universal among photogs) . That raised a question of whether I'd be able to do that with a digital camera; as you most perceptively (and implicitly) note, the difference is now entirely in the eye of the beholder, not the hardware. The answer was not at all obvious to me, since I don't understand what lets me switch on the fly in the first place. As for the first part of your query, tackle the question differently: start with the axioms-- as you note, I have a well-endowed noodle (thank you!) and some established skill, BUT I am obviously working with cliché. Why would I bother using my time and energy to make these (which I did not do for the purpose of writing this column). And having done so, why would I subject you to them? Assume there's method behind my madness. Assume it's not a joke. Assume I do not consider them merely a waste of time and photons. Yeah, I know this second answer *IS* a bit obscure, but that's by intent. If I wanted to describe in words my point, I would have. Best of the season to you, too, my friend! hi again..ok...i wondered about the color/bw thing because...well, for a total computer guy to have difficulty pushing a digital button 'on the fly' made no sense whatsoever. As to the other, well, i have to say i am pretty literal and not terribly noodle driven. As to why you subjected us to these photos it's hard to imagine but here are some possibilities: 1) You're collecting data on cliche identification and tolerance by savvy visual artists, 2)You acknowledge and accept that "it's all been photographed" and you're starting from the beginning (hint for next subject: doors and windows), 3)You like your own work and the cliche topic gave you a reason to show some of it, 4)You're illustrating Leonard Cohen's lovely old song about birds and wires, 5) You want to put to bed once and for all the silly notion that one should zoom with one's feet, 6)You REALLY like birds and/or old fashioned above the ground utility service. In other words, i HAVE no idea, Ctein! If it's all about which photo is the best cliche then taking my cue from the reader who hoped your favorite is not #3 because everyone has one then i give the award for best cliche to #3. Absolute perfection. Geez. How long will it take for all these to scroll off? They're hurting my eyes. No offense. Okay Ctein, I've been thinking about your column, and looking at those pictures for what, three days now? And I think I finally get it. 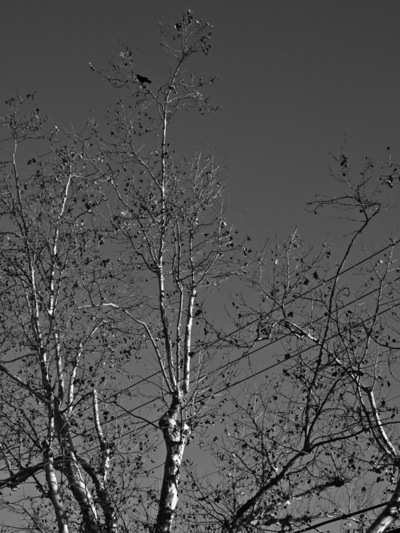 Sometimes, what appears to be a cliche, on the surface, isn't really a cliche at all, but a profound insight into the inexplicable behavoir of birds. 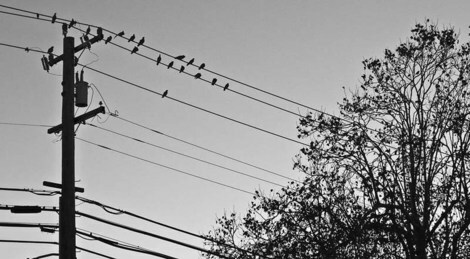 See, you have these birds perched on a wire, fraught with the danger of electrocution, and nearby, there are those lovely trees that could have provided a roost, as well as shelter and shade, yet our fine-feathered friends chose to wrap their talons around high voltage wires. So far so good? 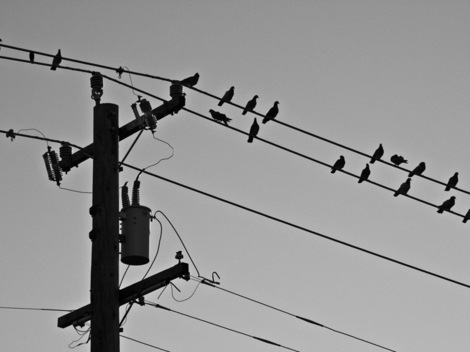 This can only be a commentary on birds drawing our attention to the scars of technology dotting the landscape. And the birds are saying that no matter how much humans defile our land, we, the brotherhood of fine-feathered flyers, will make the best of the stupidity of mankind. I think your readers, including me, need more clues. Thanks. 1) Some people like some of these photos... and don't agree on which ones. Some hate them all. Some have emulated them in their own way. Assuming that the truth is NOT that you're right and everyone else is wrong, what does that tell you about the concept of cliche? 2) Allowing that you're only seeing about 40% of the exposures I made, you've been presented them in the order I made them. What can glean of the process of creation (or the creator)? If the answer to both of these is "nada, zippo, nuts" for you, then move on. I ain't gonna spell it out in words, because if that were my intent, I'd have written that column instead of photographing it. 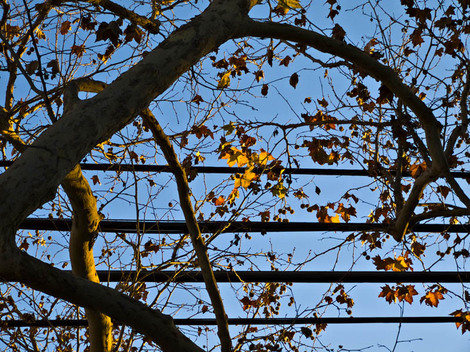 Two criteria: a) framing; b) what's more appropriate to your subject, colour or b/w? In your samples, with the same lens (zooming) you try to achieve the best framing in order to put the subject in better evidence. 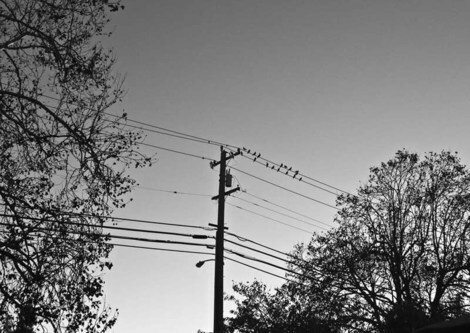 I think the best framing of the first series (birds on wires) is the last one. It goes without saying that b/w is more appropriate. 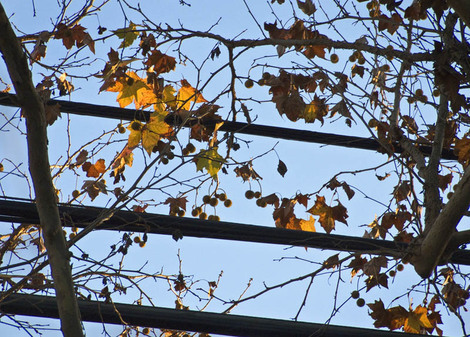 In the second series (branches, leaves and wires (I presume viewed from the same vantage point as the first series) I see the best framing in the last one. In this case colour seems more appropriate. BTW, I did a similar subject with the same digicam (Fuji s6500) last August (see http://vitaalpina.blogspot.com/2007/08/ostfriesland-north-sea_26.html).